Vijay Amritraj’s tennis career speaks for itself. The vanquisher of Jimmy Connors, Björn Borg and Rod Laver remains the highest–ranked Indian singles player (he was World No.16 in 1980), and was Asia’s No.1 tennis player for over a decade. 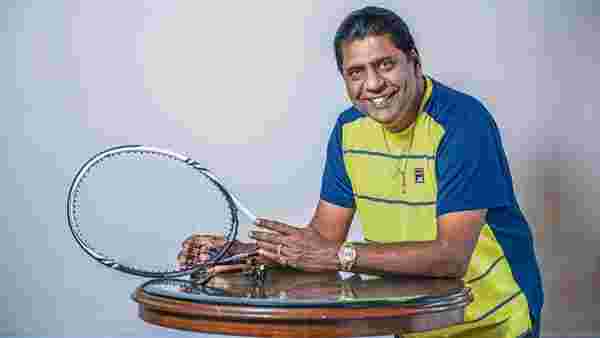 A two-time Davis Cup finalist with India, Amritraj has also been a great ambassador of the sport. He was in Delhi recently to interact with participants of the sixth edition of the Road to Wimbledon Under-14 tournament at Delhi’s Gymkhana Club. Teenagers Anjali Rathi and Veda Raju Prapurna won the girls’ tournament and Ayushmaan Arjeria and Bushan Haobam won the boys’ tournament. They will now get the chance to play at Wimbledon later this year. How important is Road to Wimbledon as an opportunity for youngsters? It’s something you dream about for the kids. Because you know, this isn’t something we could have even dreamt about when we were playing. And Wimbledon was so far away. UK was so far away, London was so far away. You were left with £3 in your pocket. Today Wimbledon is coming to you, to your doorstep. It’s saying, with your talent, you’re here. With your hard work, you can get to Wimbledon, play on the grass courts, and that’s a very unique opportunity for these 14-year-old boys and girls. How different is the sport from when you were starting out? Everything has evolved, you know? The game has changed to a great extent. Opportunities have gone beyond belief. I couldn’t have dreamt of what has happened in my lifetime. We are a slow-moving country, especially when it comes to sport, because we’re such an education-oriented society. So I think if you were to look at it today, every housing complex that comes up now with any bit of land ends up having a tennis court in it or a running track or a swimming pool. This encourages kids to go out and kick a football or go out and play tennis or whatever. So I think the opportunities are much greater. More sponsorships are available. States are pumping in more money into sports. Television is a major component and, also, you know what you’re shooting for. In our day, we were flying blind. How good are the current crop of Indian players in singles tennis? So the ranking pretty much judges how good you are. That’s the greatest thing about tennis, it is based entirely on merit. There’s no selection committee like other sports have. So the only yardstick is the ranking. For the country, you really need to have players in the Top 50, otherwise it is difficult to make the World Group in the Davis Cup or the Federation Cup. So the focus needs to be exactly there, so we can get better and better. Prajnesh (Gunneswaran)’s performance at Indian Wells makes a big difference to his performance, in my opinion, for the rest of the year. If he can keep himself fit, I think he can continue this sort of confidence-building experience that he has had here and he can even go further deep into the tournament. (Gunneswaran advanced to the third round of the Indian Wells Masters Tournament, beating former World No.18 Benoît Paire and current World No.18 Nikoloz Basilashvili). Those were huge matches for him to win. Every match makes a huge difference. So now he’s going to get into all the Grand Slams. Which is brilliant. And this gives him the chance to showcase his talent on the biggest stage. And that’s where we need to be. Is it easier or more difficult for younger tennis professionals to break through? The ATP Tour is on its own and now the ATP has proposed an ATP Cup in Australia. And as far as we’re concerned, the ITF Futures Tours are all gone away. It’s harder to get those points to get into the Challengers. So it does make it difficult for the guys who are just starting out. Now there have been major changes and shuffles going on and we have to see what happens when the dust settles. You’re still very involved in the sport. How do you manage your time? I work very closely with Rolex as a brand partner and I do a lot of things with them. And they have some amazing programmes, and the philosophy of the way they run the company literally matches the quality of the watch. So for me, it is special to be able to work with someone like that. I have a couple of other brands that I work with in a completely different scenario. I work with my son Prakash in the film business, plus about 15-20 public speaking engagements every year. I do a lot of television work as well. So I’m literally all over the place. But it’s fun. It keeps me knowledgeable about what’s happening in the sport today. This sport gave me everything in my life and more. And I never could have imagined that I could have got so much from any walk of life. I play golf in my spare time, I see a lot of movies but I like to be abreast of what’s going on. With clay and hard courts dominating the game, how important is it for players to be good on grass? Ninety per cent of the tour is not on grass, either clay or hard courts. And most of the hard courts are slow hard courts. But grass courts have also been changed to a considerable extent to make them much, much slower. So it’s playing closer to hard courts. It’s only that the feel of grass under your feet is what you get used to when you’re striking the ball. But even at Wimbledon, you see more clay court tennis being played on the grass than when we played. You see modern greats playing at a similar intensity even later into their careers. Are the peak years getting longer? No, they’ve just managed their careers better. When you’re talking of players like Roger Federer, who’s 37 now, they’re only playing 12 or 14 tournaments a year, over 52 weeks. Which is nothing. So they manage it much better. They only play singles mostly. Wimbledon is 13 matches but over 14 days, so you get a break after every match. Except for the four Grand Slams, which are best-of-five sets, every other tournament has three sets. We played five sets around the year. So there’s a lot more longevity possible. What do you tell the kids when you interact with them for Road to Wimbledon? I always end with saying that if something like this doesn’t inspire you, you shouldn’t be playing tennis. Go do something else, you know? Because these are all opportunities that are coming to your doorstep. And so, if you like the game, it can’t be treated as work. Because the desire should be so overwhelming, the passion, that it cannot be considered work. The dream of getting to Wimbledon should overshadow everything else.